Fellas, THAT is a pipe!! Wow! Beautiful pipe! What an interesting piece of history as well. Thanks for sharing that piffyr! Your restorations never cease to amaze. Looks like it came out of a time machine. I can't take too much credit for the condition of the pipe, Dave. My touch on this one was very light. For this post, I intended to highlight the uniqueness of the pipe itself rather than the work that was done. Are there any stampings on the windcap that would indicate that it was made by GBD and not a third party? The word "reposé" refers to the windcap design having been either registered or patented. There appears to be a tiny stamp at about 10 o'clock on the picture of the besel seen straight on. I think that's only the reflection of the camera's focus bulb, Jesse. 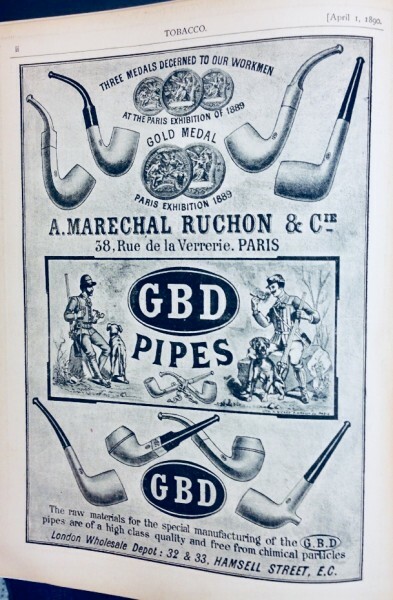 The last image above shows every bit of the nomenclature on the pipe. I've considered that the cap may not have been made by GBD. There's no maker's mark on it at all. The General Dodds reference and the year of make match up to the same time frame though. So, I'm thinking that it's original to the pipe at the time of "sale" even if it's not factory made, if you know what I'm saying. Then again, I may be over-romanticizing. I try to avoid that as much as I can, but I'm as susceptible as the next pipe nerd. Stunning pipe, in incredible condition. An amazing survival. I tend to agree that the cap is contemporaneous with the pipe. From what I can tell of Dodds' career, he became a general in 1892; it would make sense that the pipe commemorates that event. Whether it was a model released to the public, or the personal property of Dodds is unknown (at least to me). I guess if another one ever turns up we'll have an answer. Thanks for posting that. Inspiring. Thanks for that ad photo, Jon. I haven't seen that one before. very, very nice. My heartiest congratulations! Wow, amazing! If only that one could talk, eh? What Facebook page was this pipe featured on ? Sure is a great looking pipe! Amazing, just amazing. 1892 is the year that Dalton Gang tried to rob a bank and was shot. I think I'm in, like, a dozen FB pipe groups. I posted photos in a few of them. Fairy tale pipe, so old and in such good condition. Fantastic! Wow...such a wonderful piece of pipe history...and in such great condition. Thank you for posting this...I love seeing these occasional gems that turn up on here. Yep to all. Color me jealous. The work label in the bowl is the icing on the cake. In general, I believe that every pipe that can be smoked should be smoked, but that is the one pipe that I would have difficulty setting a match to simply because of that little piece of paper in the bowl. Simply wow ... lat 19th century, looking like it was made yesterday !